Students of St. Teresa of Calcutta School don’t mind spending time at night in the school gym as they learn of their school’s Blue Ribbon award Thursday night, Sept. 28. A raucous cheer rose up in the gymnasium among students, parents, teachers and staff of St. Teresa of Calcutta School in Limerick Thursday night, Sept. 28, as they heard the news that they’d been named a National Blue Ribbon School of excellence by the U.S. Department of Education. Father Paul Brandt, pastor of St. Teresa Parish, delighted the crowd with the announcement and led a host of speakers including state Sen. John Rafferty who congratulated, encouraged and challenged the school community to continue joining their high achievement with a commitment to growing in their Catholic faith. A similar scene played out at other Catholic schools in the region that won the award including St. Maximilian Kolbe and SS. Simon and Jude, both in West Chester, and St. Joseph in Downingtown. Gwynedd-Mercy Academy Elementary in Spring House, Montgomery County, also was named a National Blue Ribbon School. Public schools receiving the award in the Philadelphia region included McCall Elementary in South Philadelphia, MaST Community Charter in Northeast Philadelphia and West Chester East High School in West Chester. Across the United States 342 schools received the honor, yet the five Philadelphia area Catholic schools were among only 50 non-public schools awarded in the nation. 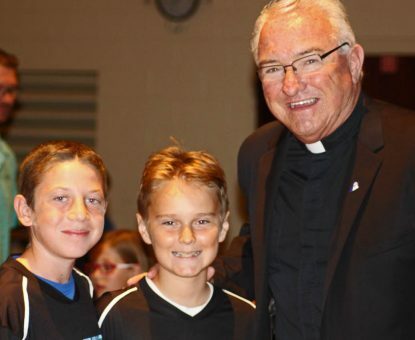 Father Paul Brandt, pastor of St. Teresa of Calcutta Parish, enjoys the announcement of the Blue Ribbon School award with two of the school’s students. Joining her at St. Teresa’s was Christopher Mominey, secretary for Catholic education in the archdiocese, who reminded the students attending the announcement with their parents never to forget the faith formation component of their studies nor the sacrifices made for them by their parents. 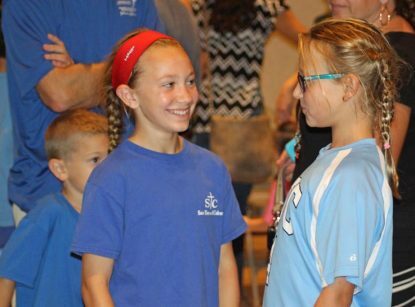 The students listened politely, then broke into cheers when informed by Mominey that they would have no classes the next day, in celebration of the Blue Ribbon award. The designation for all the schools represents the end of a year-long application process that relies on standardized tests scores supporting two main criteria. The schools must show they are in the top 15 percent in reading and math scores across the U.S., and that they show significant achievement in closing the gap between the highest performers and the lowest in the school. Also, a school must be in operation for a minimum of five years. St. Teresa of Calcutta is unique among the Catholic schools awarded since it is only nine years old. The parish itself was founded only in 2006 after St. Peter Parish in Pottstown and St. Clare Parish in Linfield closed, resulting in the new parish (Blessed Teresa at that time) that continues to serve a growing community in Limerick, Montgomery County. Students of St. Teresa of Calcutta School together recite their school’s mission statement at an event Sept. 28 celebrating their Blue Ribbon School award.